Scotland's only Conservative MP, David Mundell, has been appointed as the new secretary of state for Scotland by the prime minister. Mr Mundell, the MP for Dumfriesshire, Clydesdale and Tweeddale, had formerly served as a junior minister in the Scotland Office. His appointment was confirmed on Twitter by David Cameron. Following the appointment, he confirmed UK government plans to push ahead with the Smith Commission proposals. Dismissing the suggestion by party colleague Boris Johnson that a "federal offer" be made to Scotland, Mr Mundell said the current plans for further devolution to Scotland would be brought forward in the Queen's Speech and would be a priority. He said: "The government's position is to bring forward the Smith Commission proposals. Those proposals will be the subject of parliamentary scrutiny and debate and I'm sure amendments will be made. "I'm sure there will be discussion, that's how our parliament works. I'm sure existing MPs and new MPs will play a full part in that discussion." Mr Mundell added: "Obviously if people bring forward amendments they will be looked at. We are not going to prejudge that." Former Labour first minister Lord McConnell has called for the Smith Commission to be put on hold and replaced by a constitutional convention. Meanwhile former Conservative Scottish Secretary Sir Malcolm Rifkind has proposed a Royal Commission to consider UK-wide devolution. The SNP want David Cameron to go much further with additional powers, including full fiscal responsibility for Scotland. 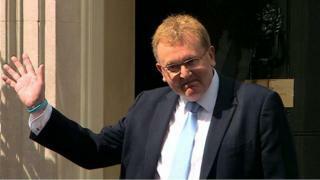 Mr Mundell's appointment was one of several made by Mr Cameron over the past two days as the prime minister reshuffled his cabinet in the wake of his Conservative Party winning an overall majority in last Thursday's general election. The Scottish secretary post was previously held by Alistair Carmichael, who is now the only Liberal Democrat MP in Scotland after holding his Orkney and Shetland seat. Scottish Conservative leader Ruth Davidson sent her congratulations to the new Scottish secretary following the announcement. She said: "I am absolutely delighted at the decision by the prime minister to promote him. "At a momentous time in our politics we need calm and experienced leadership, and that is exactly what David will bring to this post. "Having worked extensively across both Holyrood and Westminster he is quite simply the right man for the job." The SNP, which won all but three of Scotland's 59 seats in the election, had called for the prime minister to scrap the Scotland Office, which it described as a "post-devolution anomaly", and instead invest the £7m savings in public services. SNP MP Pete Wishart said: "David Mundell is the sole representative of a party that was rejected by Scotland in record numbers. It is vital that he respects the mandate of the people of Scotland, expressed so decisively last Thursday. "Scotland voted for a manifesto to end austerity, for more powers for Scotland and against the Tories' planned welfare cuts - and the UK government simply cannot ignore that."